Su-Mei Tse (born Luxembourg, 1973) trained as a classical cellist in a family of musicians. As a visual artist, her work unites sound, image, and body in a quest to communicate a universal language that exists beyond words. 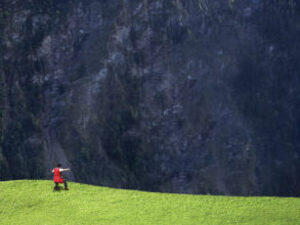 L’Echo (2003) finds the artist and her cello near the edge of a vast mountain canyon. She bows her instrument, listens and waits, then begins to play a duet with the resulting reverberations in the landscape. The moment instills wonder and inspires a physical and psychic connection to the sublime. This acclaimed work won the Golden Lion award for best national pavilion (Luxembourg) at the 2003 Venice Biennale. The video is on loan from the Miller Meigs Collection and is courtesy of the artist and Peter Blum Gallery. Curated by Sara Krajewski, The Robert and Mercedes Eichholz Curator of Modern and Contemporary Art.